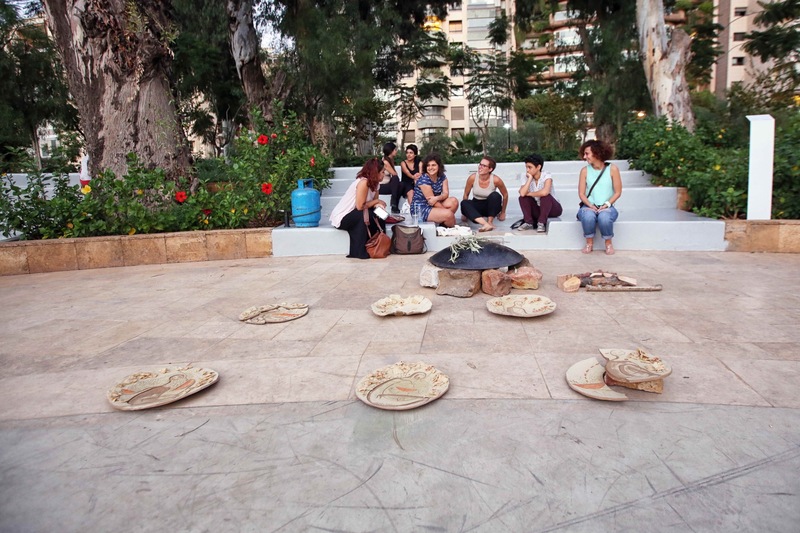 In the heart of Beirut, at the Renee Mouawad Garden, Art in Motion introduced its exhibition labelled “Resistance and Persistence”, presenting artists from Lebanon, such as Ghaleb Hawila, Ziad Antar, Yazan Halawani and Zeina Hamady, as well as international artists such as Houmam Al Sayed (Syria), Ada Yu (Kazakhstan), and Thomas Houseago (United Kingdom). The exhibition is ongoing until October 24th 2016. The founders and curators behind this event are: Rania Tabbara, “an art and design advocate” who has been working in Beirut’s art scene for 20 years and a founding member of the renown association Ashkal Alwan. Rania Halawi, a woman passionate about art and highly involved in art curation. Along with the curators are Raya Farhat, an award-winning creative director for the event and a photographer for A magazine amongst others. Last but not least, Valerie Reinhold, a cross-cultural curator who serves as the consultant for European artists in this exhibition. 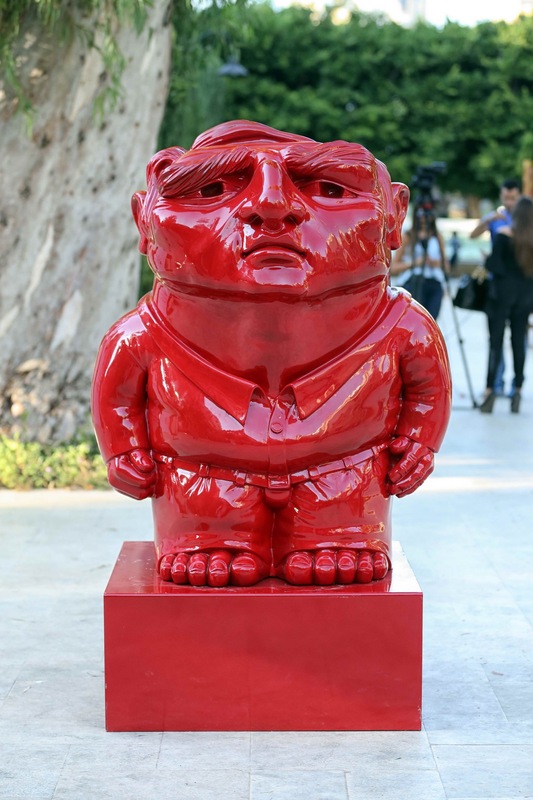 Entering through the gates of the renown Sanayeh garden, the everyday citizen is startled by the huge overlooking statues, one in red and one in black (shown below) done by Houmam Al Sayed (Syria) labelled “Citizenno zero”. 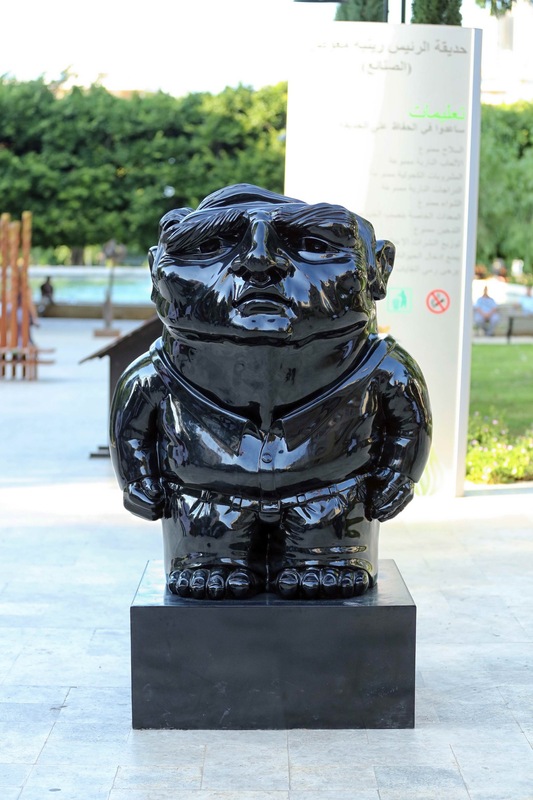 Then and there, the attendee understands that what awaits him is a dream-like walk surrounded by out of this world figures, symbolizing Beirut’s surrealist adventures. To the right, hangs a dome made out of newspaper made by Atelier Yok Yok (France), an item many Lebanese have grown knowing and seeing every morning, discovering it as a child and referring to it as an adult. The newspaper was the source for Lebanon’s tortures: the bombs, the massacres, the martyrs. However, it was also the teller of victories and achievements. The dome, possible reminiscent of the egg in Beirut’s down town, shows the light living of the everyday Lebanese, regardless of the hard realities they carry. The heritage of Lebanon and the Arab world meet in this intersection of art and life, in which the women baking bread provide an artistic take on the simple leisure activities of the contemporary Beiruti, from childhood until adulthood, rich or poor, man or woman, regardless of the war, and regardless of the struggle and the pain of urban life in this city. 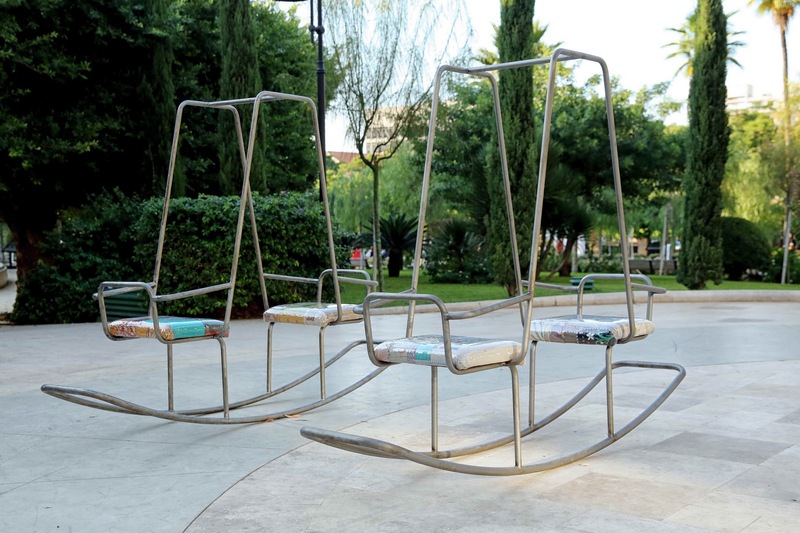 This resistance is represented by the swings (“Swing me” by local Bokja Design in 2016), both aesthetic but practical, depicting the beauty of being a child in Beirut and riding a bicycle around the nearby garden, notwithstanding the lack of sleep this child has suffered due to the sound of bombings. 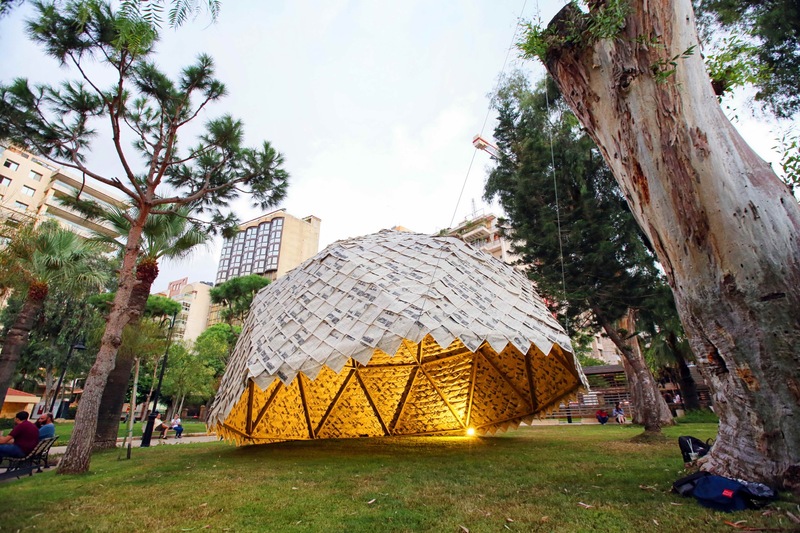 The fight for the future of Beirut is made real by the solid structures made out of everyday material, material you will stumble upon on a walk around Beirut. We can see this in “The Seven Pillars of Wisdom”, where the pieces make beauty and art out of mundane everyday objects, both solid and fragile, connoting to the character of Beirut. This symbolic piece is similar to many other works by Marwan Rechmaoui. The landmark of Sanayeh has been renovated and redesigned to cater to the modern Lebanese man, and fix the traces of destruction Beirut has survived numerously. Sanayeh garden has lived through multiple generations, and serves as a silent spectator to the struggles of Beirut. 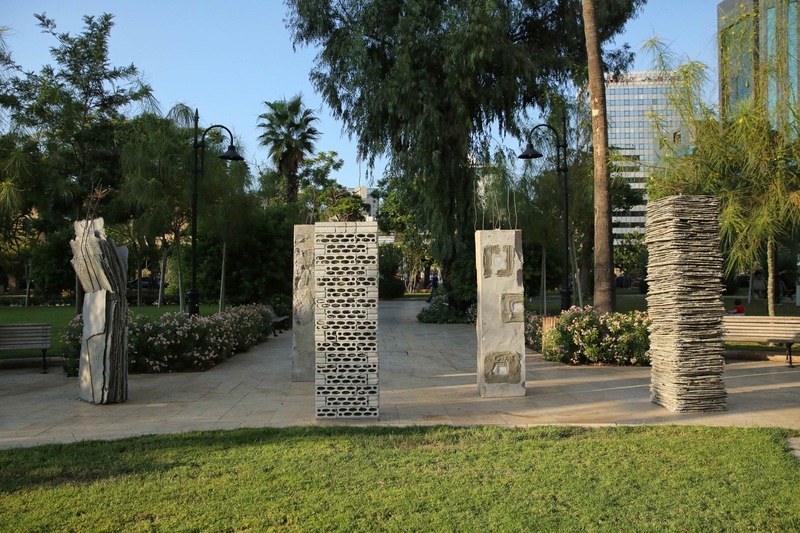 Aside from the fact that it is also a public garden, Sanayeh or “Renee Mouawad” garden is the most suitable space for sculpted art depicting “Resistance and Persistence” as the Art in Motion exhibition describes. It is the best spot because it lies in the middle of Beirut, welcoming incomers from all backgrounds, all ages and all sects in a country torn by division. Sanayeh is a hub that is all-encompassing, bringing art into the public’s everyday experience. The old men walking in the morning and the children on swings during the late afternoon can all enjoy the beauty of art and remember that Beirut is still standing, resistant and persistent. The exhibiting artists are: Mustafa Ali (Syria), Ziad Antar (Lebanon), Bokja Design (Lebanon), Chaouki Choukini (Lebanon), Karine Debouzie (France), Nancy Debs Hadad (Lebanon), Yazan Halwani (Lebanon), Zeina Hamady (Lebanon), Ghaleb Amin Hawila (Lebanon), Nabil Helou (Lebanon), Thomas Houseago (United Kingdom), Abdul Rahman Katanani (Palestine), Vika Kova (The Netherlands), Hanaa Malallah (Iraq), Randa Nehme (Lebanon), Marwan Rechmaoui (Lebanon), Lutfi Romhein (Syria), Houmam Al Sayed (Syria), Xander Spronken (The Netherlands), Xavier Veilhan (France), Atelier Yok Yok (France), Ada Yu (Kazakhstan), Cathy Weyders (Belgium), Ghassan Zard (Lebanon).